Garden Grove, Ca: "65-year-old woman thwarts robbery on jewellery store after opening fire on five armed men"
Five armed men who attempted to rob a jewellery store were left scrambling for the door when a 65-year-old woman opened fire on them. . . . They ordered everybody to drop to the ground, while opening up pillowcases and demanding cash in what was likely to be a violent smash-and-grab heist.But the robbers were thwarted in their tracks when the 65-year-old storeowner heard the commotion from the back of the store.She ran into the main room while firing two rounds, causing the men to panic and attempt to flee the store. The one-minute incident, which was captured on surveillance camera, shows the men falling over and stumbling into each other as they try to open the door. . . . .The elderly woman chases after them wielding her handgun as they attempt to leave in their getaway car. But their vehicle left so quickly that three robbers were left behind and were picked up a block-and-a-half later. . . .
“I just went into this McDonald’s, and I could buy a drink for a dollar and a hamburger for a dollar. But if you buy a hamburger on Amtrak, it costs the taxpayers $6.65,” Mica said. The media event was a follow-up to a Thursday hearing that focused on the railroad’s food and drink losses. A hamburger costs Amtrak $16.15, with riders paying $9.50, according to committee figures. Taxpayers pick up the remaining $6.65, Mica said. “You may even see me on an Amtrak train with a sign that says, ‘Don’t eat the food, it adds to deficit spending,’” Mica said. Toward the end of the presser, a train went by on the nearby elevated tracks, loudly blowing its horn. Mica seized the moment. “How much waste is going by? Please don’t buy the hamburgers!” he yelled at the train. Mica also said Amtrak is violating a law, on the books since 1981, that states the railroad can’t lose money on food and beverage service. “They’re violating the law,” he said, “and I may look at some legal recourse to stop them from doing it.” . . . The Department of Commerce has revised GDP data. The new data is available here and the older data is available here. 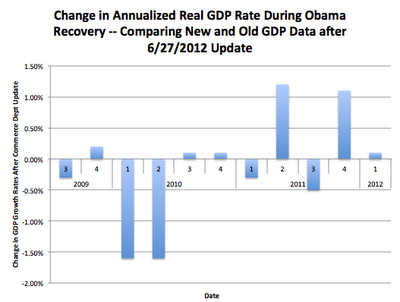 The net change from the adjustment during the recovery is -1.5 percentage points. From the second quarter of 2009, when the recession ended, through 2011, the economy grew a total of 5.8%, a downward revision from a 6.2% gain, the recasting of the past three years’ gross domestic product figures found. Only the brief 4-quarter recovery in 1980 and 1981, when the economy grew a total of 4.4%, was weaker in the past 60 years. . . . 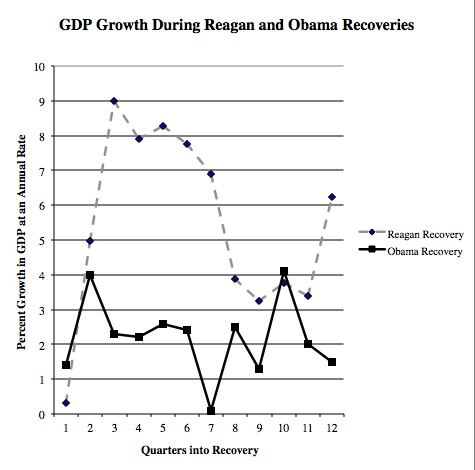 Does one really want to call the 1980 and 1981 recovery a recovery? Don't you really want to compare the same lengths of time? See this useful discussion of events by Jim Glassman here at Forbes available here. 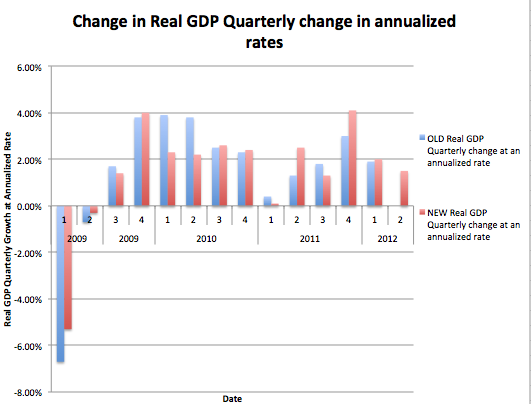 Here is also an useful figure from Economy Watch. 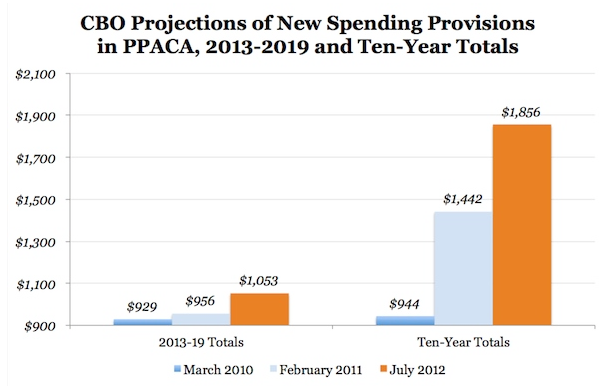 Avik Roy has put together a nice comparison of how the CBO estimated costs for Obamacare have increased over time. Melinda Buntin did the CBO estimates, but it is also interesting to note that she and her family are donated large amounts of money to Obama and Democrats. Melinda Buntin, “personally donated more than $26,000 to Democratic politicians and campaign committees,” including President Obama, and served as an Obama spokeswoman in 2008. Moreover, the Daily Caller notes a Boston Globereport that Buntin’s parents have donated almost $600,000 to Democrats since 2007. . . .
She was also an official in the Obama administration before joining the CBO. According to the Center for Responsive Politics, she donated $2,300 to President Obama in 2008, $4,000 to John Kerry’s White House bid in 2004, $9,500 to Democratic Party group DNC Services Group since 2004 . . .
Buntin, currently an Obama administration Department of Health and Human Services (HHS) official, has helped with the implementation of Obamacare’s information technology and record-keeping procedures, too. As the Director of the Office of Economic Analysis and Modeling underneath the National Coordinator for Health IT, Buntin has provided the administration with statistics and economic analyses to help it achieve its goal of collecting EHRs, or “Electronic Health Records” of Americans. . . .
Washington Post: "President Obama’s job creation problem — in one chart (with caveats)"
The one problem that I have with this chart is that it doesn't adjust for the changing sizes of the population. That adjustment would make older administrations look better. 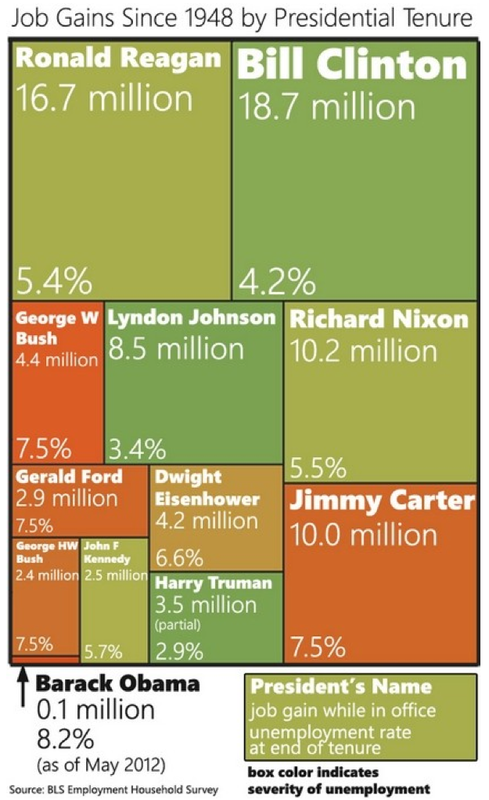 For example, how else can you compare the 2.5 million jobs under John F. Kennedy to the 100,000 jobs under Obama. 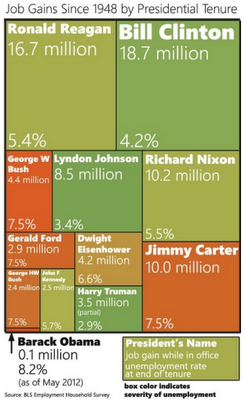 The chart is originally available from Political Math with their discussion available here. The Washington Post discussion is available here. UPDATE: I have been told that I misinterpreted the intentions of the qualifier at the beginning of the tweet on my op-ed piece. This is part of an email that I received (there is no reason to reveal who sent this to me): "Here's why I think she did it and what I think she meant: As you know, when anyone posts anything on a hot-button political issue, people online tend to respond in knee-jerk fashion--basically, in this case, we'd see a lot of 'Guns kill people--John Lott's full of it.' What she was trying to say was, don't respond that way--click the link and read the op-ed." Original post: I asked the University of Chicago Press to tweet a link to my piece in the WSJ given that piece was getting attention for my book that was published by the UChicago Press. 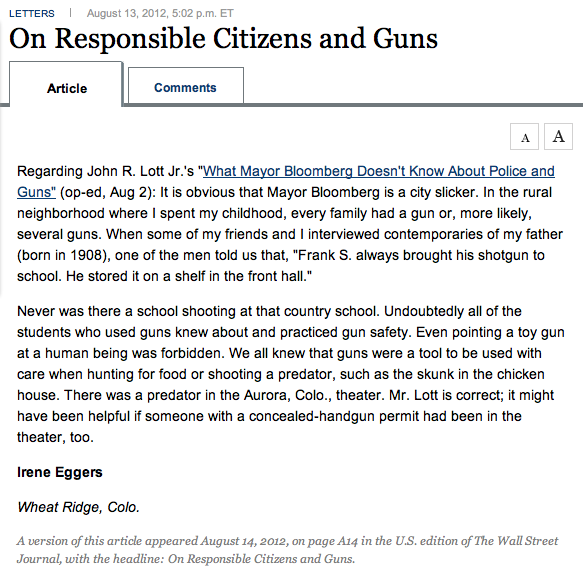 You will note that a couple weeks earlier the press had publicized an op-ed that pushed for gun control from Roger Ebert, who to my knowledge has not published a book on that topic through the UChicago Press. More interesting was how for my post the press thought that it was necessary to add a disclaimer for the post, essentially asking readers not to get angry for them tweeting the link. Our gun laws are also insane, but many refuse to make the connection. The United States is one of few developed nations that accepts the notion of firearms in public hands. In theory, the citizenry needs to defend itself. Not a single person at the Aurora, Colo., theater shot back, but the theory will still be defended. . . . This would be an excellent time for our political parties to join together in calling for restrictions on the sale and possession of deadly weapons. That is unlikely, because the issue has become so closely linked to paranoid fantasies about a federal takeover of personal liberties that many politicians feel they cannot afford to advocate gun control. . . . There are no facts in Ebert's piece, though he is good at whipping up emotions. While it is indeed true that some care about the loss of freedom, I would guess that most of the people in the middle of this debate care about safety, and given the number of Americans with guns, I think that I can show that would be the vast majority of gun owners. When the Olympic runners take to their positions on the track later this week, they'll crouch on the ground, ears pricked, and wait for the starting beep. That's right, a beep. Not the pow of a gun, but an electronic tone, pumped through speakers, played by a "pistol" that's not a pistol at all, but something more akin to an electronic instrument with only one key. The pistol itself is silent. The electronic "pistol" of this summer's Games was designed to overcome an astonishing problem: The speed of sound is too slow for Olympic athletes. That is to say, athletes far away from the starting pistol were delayed by the time it took for the sound to travel to them, and differences so tiny can matter in races in which the margins are so small. . . .
"13% of Consumers and Investors Rate Economy Positively"
Just 13% of both consumers and investors rate the economy as good or excellent. Fifty-four percent (54%) of consumers and 53% of investors rate it as poor. . . .
Their consumer index is the lower than the monthly average since last December. "Bureaucracy Still Seen by Britons as Biggest Problem with NHS"
. . . While there has been a noticeable spike in the proportion of Britons who are satisfied with the National Health Service (NHS), more than a third of respondents believe bureaucracy and poor management remain its biggest hurdles, a new Angus Reid Public Opinion poll has found.In the online survey of a representative national sample of 2,033 British adults, 35 per cent of respondents (+6 since October 2011) think the NHS works well, and only minor changes are needed to make it work better. Half of Britons (52%, -5) believe there are some good things in the NHS, but many changes are required. Only one-in-ten respondents (9%, -1) believe the NHS has to be completely rebuilt. . . . This note is nice to see in the Chicago Sun-Times. Obviously, I am not affiliated with Harvard. Possibly the confusion over the affiliation arose from my recent appearance on CNN with Alan Dershowitz. But it is still nice to see this mentioned. The dividing line seems to indicate that this is separate from the letters below it, but I could be wrong about that.
. . . HH: I want to start with the models, which are creating quite a lot of controversy. In Florida, the model that Quinnipiac used gave Democrats a nine point edge in turnout. In Ohio, the sample had an eight point Democratic advantage. What’s the reasoning behind those models? PB: Well, what is important to understand is that the way Quinnipiac and most other major polls do their sampling is we do not wait for party ID. We ask voters, or the people we interview, do they consider themselves a Democrat, a Republican, an independent or a member of a minor party. And that’s different than asking them what their party registration is. What you’re comparing it to is party registration. In other words, when someone starts as a voter, they have the opportunity of, in most states, of being a Republican, a Democrat, or a member of a minor party or unaffiliated. . . .
PB: But we didn’t set out to oversample Democrats. We did our normal, random digit dial way of calling people. And there were, these are likely voters. They had to pass a screen. Because it’s a presidential year, it’s not a particularly heavy screen. . . .
HH: I mean, you really think that’s true? I mean, as a professional, you believe that Democrats have a nine point turnout advantage in Florida? HH: That’s not responsive. It’s just a question. Do you personally, Peter, believe that Democrats enjoy a nine point turnout advantage right now? PB: What I believe is what we found. . . . 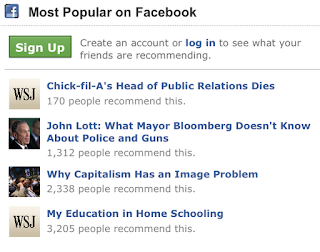 FOLLOW TODD ON FACEBOOK FOR CULTURE WAR NEWS. CLICK HERE.“They’re punishing law enforcement officers who are just trying to uphold U.S. law,” said Chris Crane, president of the National ICE Council. Crane is a union representative acting on the unidentified officer’s behalf. “The officer made the determination using prosecutorial discretion that he would charge (the suspect) as being in the United States illegally and let the judge sort it out,” Crane said. . . .
And all this is for marginal improvements in speed and access. The tracks around and through Philadelphia aren't, generally, big obstacles to high-speed rail—the tunnels in and around Baltimore, Maryland are. It would be much cheaper to replace Baltimore's terrible tunnels than to build a fancy new one under Philadelphia. . . .
Of course, Amtrak has all sorts of other ways of spending taxpayer money. The Philadelphia tunnel, unfortunately, isn't even the worst part of Amtrak's plan. That honour goes to a $7 billion renovation of Washington's Union Station (pictured), which Slate's Matthew Yglesias rightly calls "insane". Amtrak's cost estimate is many times higher than for similar projects in Europe. . . .
Brown County Sheriff’s Department and Early Police Department held a joint press conference Monday to formally discuss Sunday’s Peach House RV Park shooting which left three people and two dogs dead. According to Sheriff Bobby Grubbs, the gunman was shot by an armed citizen and responding Early Police Sgt. Steven Means who was being fired upon by the gunman Charles Conner of Early. Grubbs stated that the gunman and the victims had a verbal confrontation about the dogs, and that Conner shot the male victim, then the dogs, and turned the gun on the male victim’s common law wife with a .9mm handgun. Other residents of the RV park were in their homes as the incident occurred, stated Grubbs. Two adult male residents were reported to have heard the gunshots and saw the victims’ bodies, one of the male residents was the initial reporting party. Conner was reported to have gone into his RV which was approximately 75-100 yards away and retrieved a 30-30 rifle which he used to shoot at the responding officer and another resident, according to Grubbs. He was also armed with two pistols during this time, said Grubbs. . . . Economist Michael McDonough claims that train carloads of garbage can explain 82% of the variation in US GDP.
. . . The latest sign of the tightening Valley-Beltway connection came in June when local search service Yelp Inc. tapped former White House press secretary Robert Gibbs to join its board of directors. Online-payment company Square Inc. added former Treasury Secretary Larry Summers to its board last year. Other start-ups say they are hunting for similar board recruits. Political figures from former Secretary of State Condoleezza Rice to former Vice President Al Gore have been part of the Bay Area intelligentsia for years, often as advisers to large venture-capital firms or through university affiliations. Large tech companies such as Microsoft Corp., Google Inc. and Facebook Inc. have also staffed up on Washington insiders in recent years as regulatory scrutiny on them has intensified. Facebook added Erskine Bowles, former White House chief of staff, to its board last year. Smaller companies are now getting in the game as they become tangled in policy issues ranging from privacy to antitrust to financial regulation. 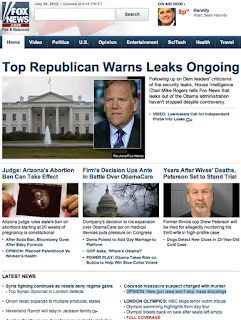 "They are containing the threat early," says Dennis Carey, vice chairman of recruiting giant Korn/Ferry International. Mr. Carey says young tech companies are getting ahead of potential scrutiny partly to gain credibility with potential investors before an initial public offering. Mr. Carey says he has several assignments for companies looking to add someone with Washington experience to their boards, though he declined to name them. . . .
A congressional report concluded Friday that "political pressure" by a White House eager to tout stimulus spending was largely to blame for fast-tracking the ill-fated $535 million Solyndra loan guarantee -- findings compounded by the release of an email that showed the former CEO once referred to the aid as "The Bank of Washington." . . ."It is clear (the Department of Energy) should never have issued the loan guarantee to Solyndra," the report said, adding that a subsequent decision to restructure the terms "violated the plain language of the law." . . .
HotAir has this: "OMB warned WH to cut losses on Solyndra," but their concerns were overridden by Jack Lew. Instead of heeding her advice, Lew overrode the concerns and pushed for the second round of investors to attempt a rescue. We ended up losing nearly four times what taxpayers would have lost had Lew and the DoE cut their losses when it became clear that Solyndra was a bad investment. Why did the Obama administration take that risk? The investors in Solyndra included George Kaiser, one of Obama’s bundlers from the 2008 election. Lew got a promotion after this decision, while taxpayers got the shaft. If that’s the incentive system in this administration, don’t be surprised to see many more Solyndras as Congress pulls back the curtain on Obama’s green-tech subsidy program, which got tens of billions of dollars from his bigger flop, the 2009 stimulus bill. Congress will have to work overtime to get a sense of just how badly those dollars were spent. . . .
Can Obama make up his mind on the value of "shovel-ready" job spending? Remember just over a year ago when Obama confessed that "'Shovel-ready' was not as shovel-ready as we expected." Well that was then. Now Obama is back on the old claim: "If we’re investing in roads and bridges, putting some hard hats back to work, getting our steel workers back to work, they got some more money to spend. Maybe they buy that new computer. Maybe they decide to take a little vacation. And all that money circulates in the economy and it makes us all grow." Of course, there are other problems such as where the money has to come from. General Motors' profits fell 41% in the second quarter as troubles in Europe undercut strong sales in North America.America's largest automaker made $1.5bn in the second quarter of 2012, compared with $2.5bn for the same period last year. Revenue fell to $37.6bn from $39.4bn in the second quarter of 2011. The results exceeded analysts' estimates, but further underlined Europe's drag on the US economy. . . Meanwhile the Federal government is buying a lot of GM cars. Budgets may be tight, but the federal government has increased its fleet of cars to 449,000 vehicles — or nearly one for every seven federal employees — according to the Government Accountability Office.The Department of Veterans Affairs saw the biggest jump, adding 49 percent more vehicles between 2005 and 2011 — or even more than the Homeland Security Department, which was new in 2005 and has steadily grown since, including doubling the size of the U.S. Border Patrol. . . .
"TEENAGER KILLS 8 , WOUNDS 5 IN CHINA KNIFE ATTACK"
The teen killed two of her family members and six more people before fleeing, the state-run Legal Daily newspaper said. It reported he was caught but did not describe the circumstances. The official Xinhua News Agency said the attack took place Wednesday night in Liaoning province. Media said the 17-year-old suspect is from Fushun city and his surname is Li. The attack happened in Yongling town. . . . There was a string of knife attacks against schoolchildren across the country in early 2010 that killed nearly 20 and wounded more than 50. Take the annual survey by the National Association of Chiefs of Police of more than 20,000 chiefs of police and sheriffs. In 2010 it found that 95% believed "any law-abiding citizen [should] be able to purchase a firearm for sport or self-defense." Seventy-seven percent believed that concealed-handgun permits issued in one state should be honored by other states "in the way that drivers' licenses are recognized through the country"—and that making citizens' permits portable would "facilitate the violent crime-fighting potential of the professional law enforcement community." . . . Please leave comments at the WSJ website available here. Some of the information referenced in my piece. Survey from Police Magazine and San Diego Police Officers Association. Other related info: Survey of Police officers in Lehigh and Northampton Counties in Pennsylvania. Bloomberg quote high capacity magazines. 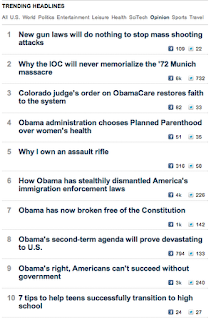 The Huffington Post has this collection of comments by and about Bloomberg's comments on guns. 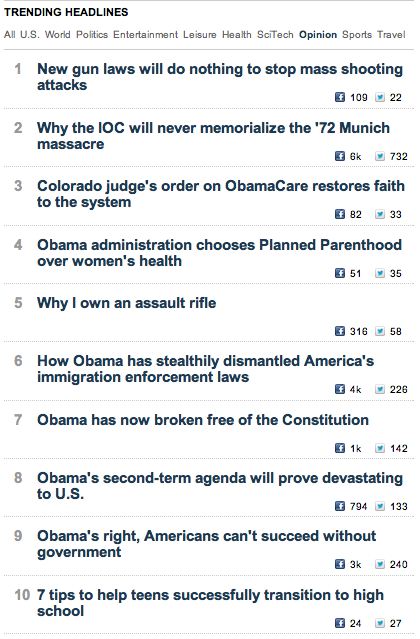 Needless to say it is very pro-gun control, but, after all, it is the Huffington Post. 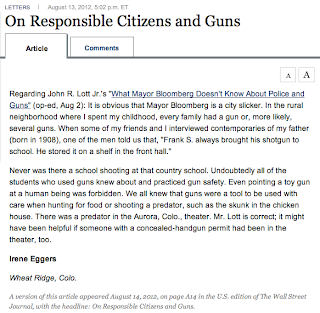 Nearly two weeks after the mass shooting in Aurora, Colo., New York City Mayor Michael Bloomberg, one of the nation's outspoken gun control advocates, is unimpressed with the political fallout.The mayor has been on a media blitz following the massacre . . . .
Not one accustomed to being dismissed or ignored, Bloomberg lashed back in a phone interview with The Huffington Post on Wednesday. "I don't think there's anybody, any rational person, that seriously could argue that what we have and the way we enforce it prohibits carnage," he said. ". . . So the argument that we can do with existing laws and stop this is just preposterous. It isn't worth having a discussion about." . . . I guess that I agree that we should just keep the existing laws. How to measure the US success in the Olympics? 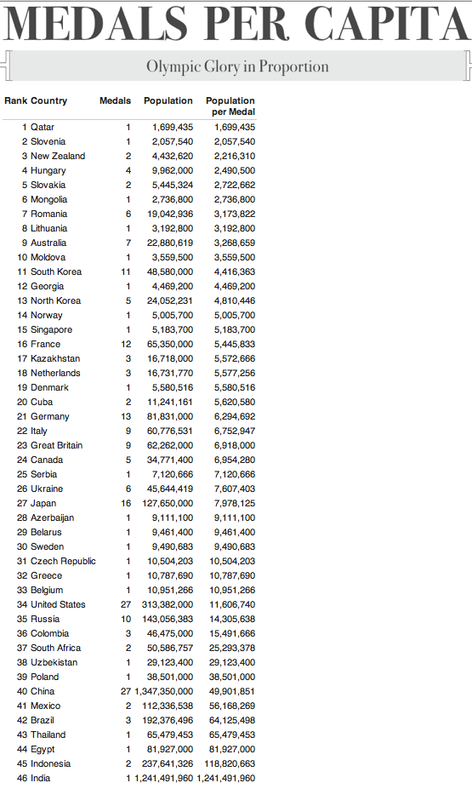 The best way to measure the success that a country has is in terms of Medals per Capita, not total medals. While the current conditions rating is back to where it was in the beginning of the year, the outlook rate is the worst that it has been this entire year. The wide party gaps are explained in large part by the fact that the majority of Democrats (55%) feel that the economy is getting better, while the majority of Republicans (83%) and independents (63%) say it is getting worse. . . . In the summer of 2009, 58 percent thought the economy would be stronger within five years. By the summer of 2010, only 50 percent had such long-term optimism. By last summer, just 46 percent were that upbeat. And now only 40 percent think the economy will be stronger in five years. . . .
"I think they were doing more damage control than anything," he testified, as quoted in the investigative report. "My view is that the whole matter of the department's response in this case was a disaster." . . . The report faults Hoover for knowing Newell had employed "risky tactics" but allowing them to continue. Chait, for his part "paid a surprisingly passive role during the operation," while McMahon seemed to be nothing more than a "rubber stamp" for field operations, the report concludes. . . .
More examples of government waste: "dozens of questionable GSA conferences, millions in bonuses"
Remember Jeff Neely, the government official photographed living it up in a hot tub at a Las Vegas conference? "He was the tip of the iceberg," says Rep. John Mica, R-Fla.
Mica's committee is now looking into wasteful spending at as many as 77 other General Services Administration (GSA) conferences -- all uncovered in documents obtained by Fox News. . . .
One of the more troubling conferences was held in 2010 in Crystal City, Va., where GSA employees within the Federal Acquisition Service spent hours drumming in what administrators billed as a "team-building" exercise. But while lawmakers first uncovered that conference earlier this month, documents obtained exclusively by Fox News show the event was the setting for millions of dollars worth of bonus handouts. According to the records, more than 3,700 employees received bonuses averaging about $1,000 apiece at the conference. The cost to taxpayers was $3.6 million -- minus the cost of the drumsticks, and the consultant who headed up the exercise. . . .
Treasury Secretary Timothy Geithner and congressional Democrats blasted the Federal Housing Finance Agency on Tuesday after the regulator announced it would not allow Fannie Mae and Freddie Mac to offer loan principal reductions to struggling homeowners, as tensions over how to improve the sluggish housing market remain high before the November elections. Democrats have been pressuring the FHFA, the independent agency in charge of overseeing the taxpayer supported mortgage giants, for months to back off its opposition to allowing Fannie and Freddie to provide some debt forgiveness to homeowners. The regulator’s acting director, Edward DeMarco, has been unmoved by their arguments, and has infuriated some Democrats. “It is incomprehensible that Mr. DeMarco would reject the chance to save up to a billion dollars in taxpayer funds while helping nearly half a million homeowners stay in their homes,” Rep. Elijah Cummings of Maryland, the top Democrat on the House Oversight and Government Reform Committee, said in a statement on Tuesday. In the latest effort to entice DeMarco to move in the Obama administration’s direction, Treasury had proposed earlier this year allowing Fannie and Freddie to participate in a program where the cost of loan writedowns would be covered with remaining funds from the 2008 bank bailout law — the Troubled Asset Relief Program (TARP). On Tuesday, DeMarco rejected the idea, arguing that his agency’s job is to protect taxpayers from losses resulting from the government’s rescue of Fannie and Freddie in 2008 and the proposed use of TARP funds does not address that concern. “I have concluded that Fannie Mae and Freddie Mac’s adoption of [the Treasury program] would not make a meaningful improvement in reducing foreclosures in a cost effective way for taxpayers,” DeMarco wrote to lawmakers on Tuesday. . . .
Notice the objective headline on this over at Bloomberg.com: "Regulator Leaves Underwater Homeowners High and Dry"
DeMarco, acting director of the Federal Housing Finance Agency, said today that he won't allowFannie Mae and Freddie Mac to engage in debt relief for borrowers who owe much more than their homes are worth. In doing so, DeMarco clearly put ideology ahead of economics, hindering the housing market's recovery in the process. . . .
You have to love the claims that giving away money is the way to save it. The most mind-boggling aspect is that FHFA's own analysis shows principal reduction would save the taxpayer-backed mortgage giants as much as $3.6 billion compared with other modification efforts. . . . .
Ted Cruz has been someone who I have known personally and someone who will be an awesome US Senator. If you live in Texas, I strongly hope that you will consider voting for him. I know that my relatives in Texas will be voting for him. “This crime cuts against the fabric of our free society,” Judge Webster said. . . . The temperature record from stations across the U.S. has been systematically overinflated due to faulty data manipulation and “encroaching urbanity” -- locations near asphalt, air conditioning and airports -- according to a new study. And if correct, it calls into question just how hot our planet is getting. Global warming believer-turned-skeptic Anthony Watts, a former TV meteorologist, posted a new report online questioning the reliability of weather stations in the U.S. Historical Climatology Network, a 120-year-old weather system that forms one tent pole of climate measurements. As the country has evolved, building urban metropolises and airports and pouring parking lots, the weather stations haven’t moved -- and poorly cited stations are spoiling the data. . . .
That problem of poorly cited stations is well established. A sensor in Marysville, Calif., sits in a parking lot at a fire station next to an air conditioner exhaust and a cell tower. One in Redding, Calif., is housed in a box that also contains a halogen light bulb, which could emit warmth directly onto the gauge. . . . Some of you all may remember my incredibly weird interview on CNN last week (available here). Jason Lewis' comments on the whole affair are available here (you can also go to the Jason Lewis Show's archives here and go to the third hour of the show for July 30, 2012). Thanks, Jason. I really appreciate your comments. Note: Jason says that I was a Harvard when in fact I was a Senior Research Scholar at the Yale Law School for two years. So you think that the housing market is recovering? 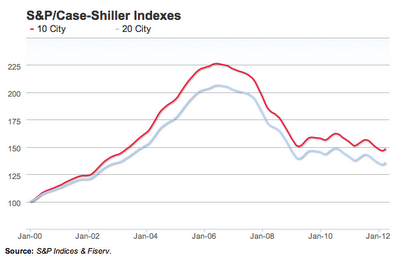 The Case-Shiller Index makes it hard to argue that the housing market has recovered. Apparently the results tomorrow are expected to show an additional, if small, further drop in prices. Data is available here. Is the stock market an even better predictor than Intrade of who will win elections? One analysis concludes that last week's sharp three-day market surge can only mean that Wall Street is banking on a victory from Republican Mitt Romney. That's the logical interpretation one can draw from a rally amid conditions that otherwise would demand a selloff, Morgan Stanley chief U.S. equity strategist Adam S. Parker said in an analysis that asserts there is no other reason now to like stocks than a Romney win. . . . The reaction is understandable, but despite the best of intentions, the laws won’t stop these attacks from occurring. What the ban would do is raise the cost of buying ammunition. But does anyone really believe that even a 20 or 30 percent increase in the price of ammo would be the difference that stopped someone intent on committing suicide or spending the rest of their lives in jail from buying ammo? It isn’t like these guys have to worry about making payments on past due credit card bills. . . . The Sacramento International Airport is considering making a security change, and it could mean getting rid of TSA agents. Fourteen smaller airports around the country have also joined the screening partnership program. . . .
A 2007 mail survey by Police Magazine is available herehttp://www.policemag.com/channel/weapons/articles/2007/03/editorial.aspx. A 1997 survey by the San Diego Police Officers Association is available here. See also: Stephen L. Christopoulos "Survey of Police Officers in Lehigh and Northampton Counties Pennsylvania." Some surveys by the National Association of Chiefs of Police: 2005, 2008, 2009, 2010, and 2011. Some information on Canada is available here. Baier: Mitt Romney's campaign has steered clear any politicization of the tragedy. As governor of Massachusetts, Romney banned some assault weapons sales but eased other gun sales. Fox News polls take an after two earlier mass shootings found nearly three three-fourths of Americans believe that tougher gun laws would not help stop such carnage. John Lott, who authored the book, "More Guns, Less Crime," says with only one exception, every multiple victim shooting has occurred in places where guns are banned, reducing the chances that a licensed gun owner would be armed and able to stop the shooter. JOHN LOTT, FOXNEWS.COM CONTRIBUTOR: These bans serve as a magnet. They actually cause criminals to be more likely to attack in those places. MCKELWAY: There is agreement in one aspect of gun control. The NRA agrees with gun control advocates that people found to be mentally ill should be prohibited from owning a firearm -- Shannon. BREAM: Thank you very much, Doug. . . .
"I'm sure we'll have more opportunity to talk about this." That was President Obama's response Thursday, ducking a question on whether his administration will beef up gun control laws in the wake of the horrific shooting in Aurora, Colo. The dodge came just a day after the president sounded off on the issue during a speech before the National Urban League, saying "a lot of gun owners would agree that AK-47s belong in the hands of soldiers, not in the hands of criminals." At the same speech, Obama -- who has pushed for an assault weapons ban in the past -- stressed "common sense" solutions could fix the problem in the future. 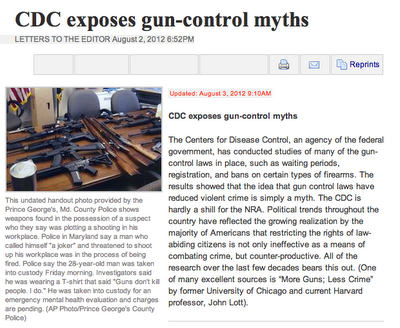 He pointed to stepped-up background checks, which he said "shouldn't be controversial." Yet the gun control issue remains controversial on the campaign trail this year, as evidenced by the president's apparent indecision on how hard to push. Obama catches criticism from the left for not doing enough, and criticism from the right for suggesting stricter rules are needed. . . .
During the 2008 campaign, Obama openly supported the reinstatement of the federal assault weapons ban. 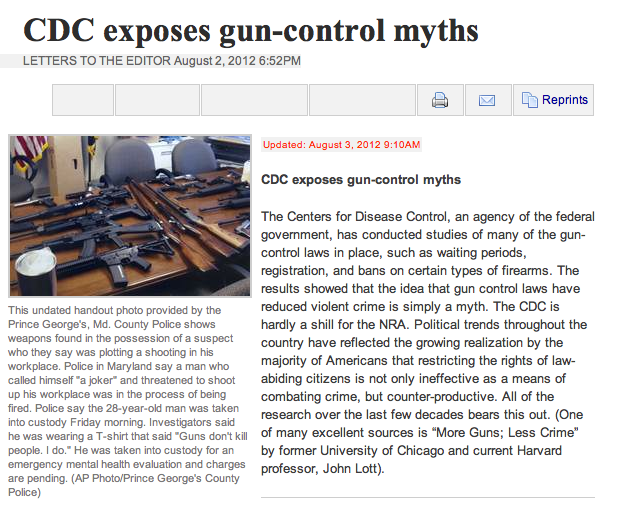 Yet Romney signed such a ban in Massachusetts as well, though it was backed by both the pro- and anti-gun lobby. "There's no question that I support Second Amendment rights," he said in 2007. "But I also support an assault weapon ban." . . .
Can you name the only American to win medals in five consecutive Olympics? The answer is available here. Hint: Despite the achievement, it won't be a name that comes readily to mind. "Mayor Bloomberg pushing NYC hospitals to hide baby formula so more new moms will breast-feed"
The nanny state is going after moms. 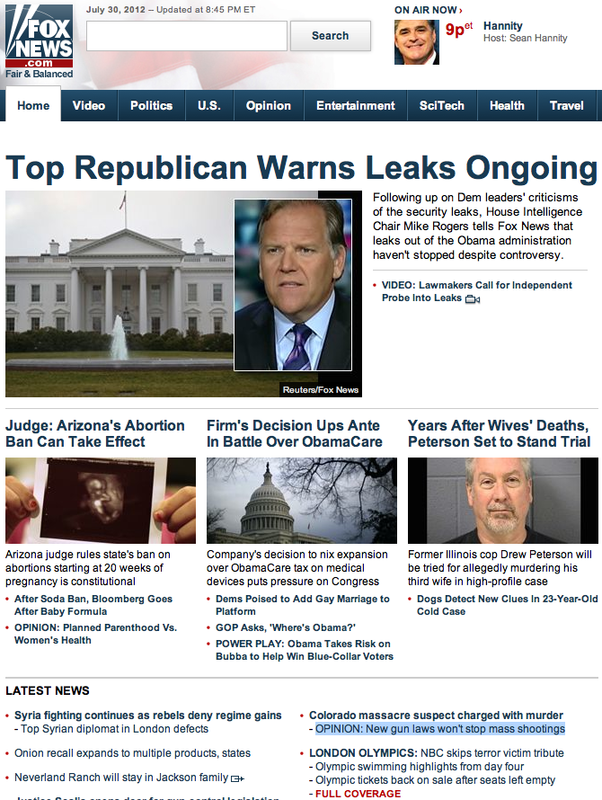 Mayor Bloomberg is pushing hospitals to hide their baby formula behind locked doors so more new mothers will breast-feed. “If they put pressure on me, I would get annoyed,” said Lynn Sidnam, a Staten Island mother of two formula-fed girls, ages 4 months and 9 years. “It’s for me to choose.” . . .
"Just 14% Think Today’s Children Will Be Better Off Than Their Parents"
The national survey of 1,000 Adults nationwide was conducted on July 22-23, 2012 by Rasmussen Reports. The margin of sampling error is +/- 3 percentage points with a 95% level of confidence. . . .
. . . Republicans say they are on the verge of being able to wrest the four seats they need to regain control of the upper chamber (three if Romney wins), but Democrats still appear to be in line to barely hold on to the majority. Things have improved for the GOP in Nevada, with Rep. Shelley Berkley’s (D-Nev.) ongoing ethics controversy hampering her chances of defeating Sen. Dean Heller (R-Nev.) in that state’s tight race. At the same time, increasingly nasty and expensive GOP primaries in Arizona, Michigan, Missouri and Wisconsin have the potential to hurt the party’s chances come November. In Florida, Rep. Connie Mack (R-Fla.) has spent weeks fighting with the local media rather than focusing on Sen. Bill Nelson (D-Fla.), who is favored to win reelection. . . .
Fenton worked for the U.S. Air Force in Texas as an acupuncturist before joining the University of Colorado in 2005.A 1998 Denver Post article quotes a Colorado acupuncturist named Lynne Fenton discussing how acupuncture could be used to enhance women's busts. . . .
Theories for last minute switch by Obama on UN Arms Trade Treaty? Assuming that this is true, why the last minute switch? Politics with the election coming up? The UN had spent the entire month of July hammering out a deal, and Friday was the deadline for an agreement on a treaty that has met with the staunch opposition of the National Rifle Association and bipartisan concerns in the Senate. “This was stunning cowardice by the Obama administration, which at the last minute did an about-face and scuttled progress toward a global arms treaty, just as it reached the finish line,” said Suzanne Nossel, the executive director of Amnesty International USA. “It’s a staggering abdication of leadership by the world’s largest exporter of conventional weapons to pull the plug on the talks just as they were nearing an historic breakthrough that would have required all nations to deny arms export licenses where there was an overriding risk that the weapons would be used to facilitate serious crimes against humanity.” . . .